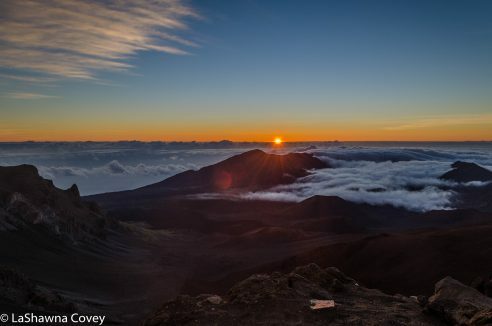 When I did my research in preparation for my Maui trip, one of the experiences that was considered a “must do” was watching the sun rise from the summit of Haleakala. I read breathless accounts of how beautiful and almost spiritual the viewing experience could be. Based on the fact that it can take a while to drive to the top of the summit, Mom and I elected to stay closer to the mountain by staying upcountry in the town of Makawao. 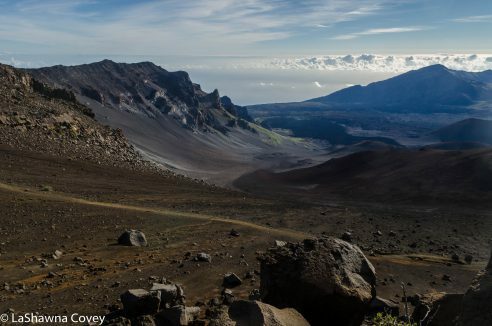 The town of Kula is closer to the base of Haleakala, but it wasn’t THAT far away to add too much to the driving time. We were visiting in the spring, so sunrise was around 6 am and the drive from our hotel was projected to take about 60 minutes. So to leave enough time to drive up the mountain, get a parking spot and be waiting for the sun to peek over the horizon, we left our hotel around 4 am. The drive to the entrance of the national park was quick and isolated, but as we drove the long, dark, twisty road up to the summit, we saw more and more cars and there was a line of cars ahead of us. 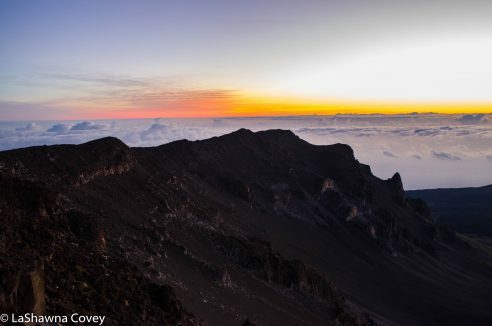 We figured there would be plenty of time to get to the summit to enjoy the pure darkness and stargaze a bit, and since it was a weekday in the spring and it wasn’t spring break, the crowds would be minimal. How wrong we were on both accounts. 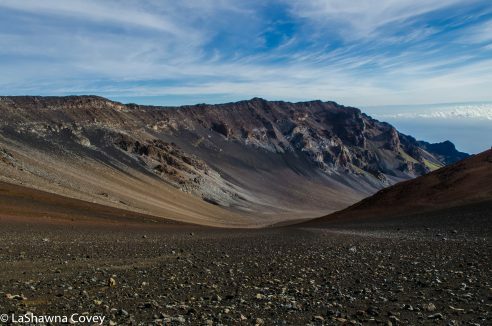 The highway up to the summit of Haleakala National Park is Highway 378, and it is really only 21 miles to the top of the summit, which doesn’t sound like it would take long at all. However, the road is a bit narrow in places (though it is a well paved road) and it is extremely twisty at points with very narrow shoulders winding around very steep drop offs. The effect is exacerbated by the inky darkness, so I slowed down a bit to make sure we didn’t drive off the mountain to our deaths. When we started the journey, it was so beautifully dark out. I mean, a pure darkness you just don’t see in cities, because there was no ambient light around, so all the stars just popped. 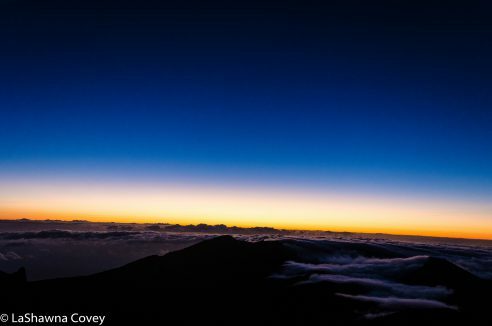 I was hoping to get some time to enjoy it before sunrise, but there was a very long pre-dawn, and when we were about halfway to the summit, we saw it getting lighter. No, sunrise wasn’t happening earlier than we thought, but the sky was brightening up in preparation for sunrise. Then when we arrived at the upper visitor center, which is located between mile markers 20 and 21 (the summit itself is just past mile marker 21), we saw that the parking guards were directing us to park at the visitor’s center, because the summit parking lot was full already. As it was, the visitor center parking lot was stacked multiple cars deep and they were stuffing them into the bus lanes. There were still ample makeshift parking spaces left, but the crowd by the fence facing the crater and sunrise was packed to the gills. People were stacked up on rocks to get a higher vantage point. I walked around hoping to find an open spot that would afford a quality view, and was about to despair of finding one and settling for a blocked view behind a bunch of taller people, when Mom worked her magic. Amazingly enough, Mom is shorter than me and at times she takes advantage of the fact that she is a very short, sweet looking older lady to get what she needs. And what she needed this morning was a clear spot on the fence. So all Mom had to do to get us some good spots was politely ask some very tall gentlemen if we could stand in front of them. Since we are both so freaking short, their view wasn’t blocked in the slightest and we all got an amazing view to enjoy the sunrise. As I said before, this morning was an extremely long pre-dawn, so we watched the colors on the horizon shift from dark blue to lighter blue to red, pink, orange and then yellow. For the most part, the sky was clear, though there were some clouds that just added to the colorful scenery. 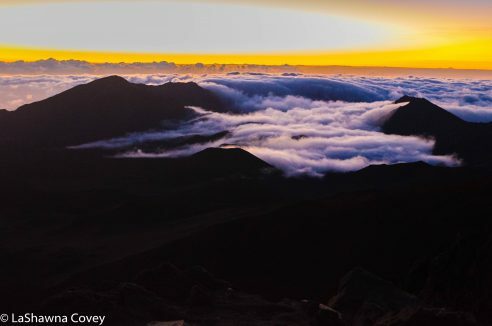 When reading up on a Haleakala sunrise visit, one of the accounts I read said that how good the experience would be depended on if there were any clouds. Meaning that if there wasn’t a cloud in the sky, sunrise is pretty but not exactly awe inspiring. However, the addition of clouds makes for more of a majestic experience as the sunlight plays across the shapes and adds depth. So I was very glad to see that there were some nice clouds, but it wouldn’t block the view of the sunrise. Sunrise itself almost felt like a teasing experience, because it seemed like the sky was going to keep getting brighter and brighter, but no sun would emerge. 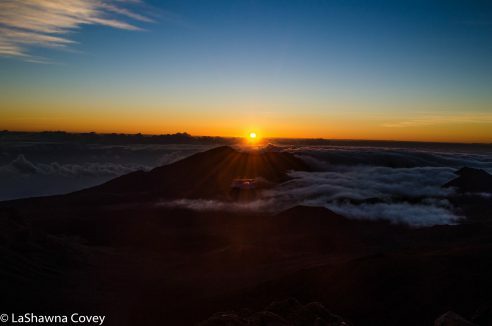 However, our waiting was rewarded when the sun peeked over the horizon and shone across the clouds and the Haleakala crater. It was definitely worth the wait, the long drive and the hideously early wake up time to experience. We stood there taking it all in and capturing it with photos until the sun rose high enough that the light was basically bright and not as colorful. At that point, crowds started dispersing, but we elected to stay and do a little bit of hiking. 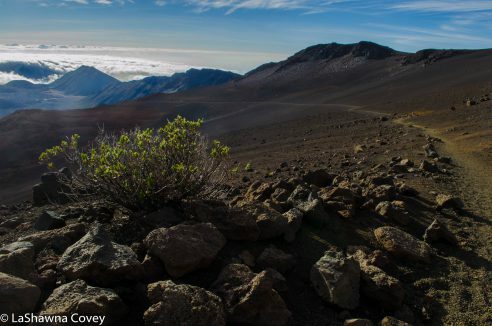 There are plenty of hiking opportunities on the mountain, though unless you are already acclimated to altitude, you probably want to take it a bit easy. The altitude around the upper visitor’s center is between 9,740 feet and we felt it immediately upon exiting the vehicle, along with the bracing cold of the spring morning. I have spent a fair amount of vacation time in the past at altitude, so I recognized the feelings of lightheadedness and near drunkenness. I typically adjust to altitude reasonably quickly, but even so, this is not an environment I want to run in or even walk too fast, because it is easy to feel lightheaded again and run out of breath. Since it was still just past 6 am and we had a light itinerary planned, there was no need to rush or anything. So Mom and I strolled around some of the trails to another vantage point about 1/2 mile away. At this point, Mom had reached her fill of summit hiking and just wanted to relax. 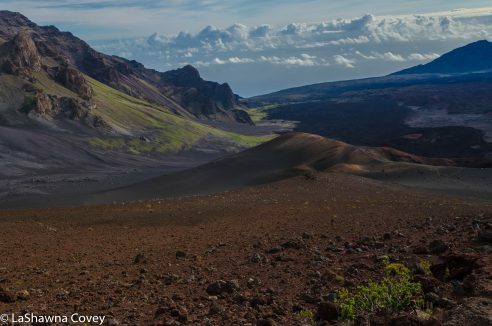 However, I wanted to hike a bit down Sliding Sands Trail which descends into the Haleakala Crater and is located a short walk from the upper visitor’s center (there are clearly marked signs directing you where you need to go). The full trail is about four miles, but it descends 2,400 feet over the course of the trail. 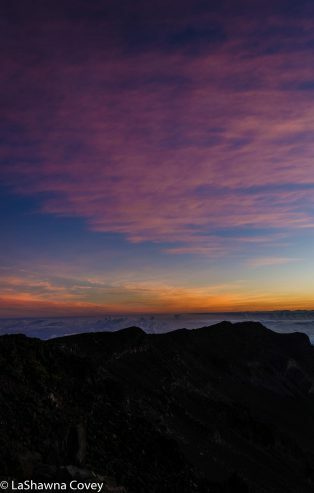 Now while that means descending the trail is reasonably easy (though a bit hard on your knees at times), you have to be mindful that you will be ascending that entire time, and hill climbing at altitude can be a physically taxing experience if you aren’t pretty physically fit. 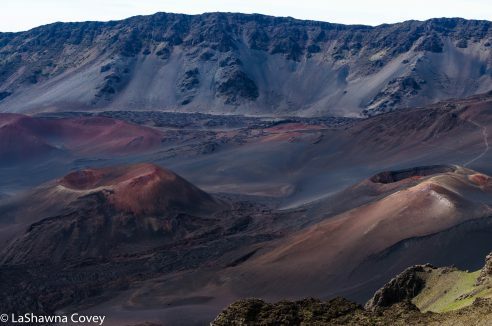 I knew I wasn’t going to do the entire trail, but I wanted to see some different views of the crater from inside rather than just overlooking it from a distance. I figured I would walk until I was ready to come back. The walk down wasn’t too bad. For the most part, the trail is well groomed and maintained. The initial descent was a switchback (keeping in mind I would have to come back up that way on the return) and then it straightens out. The surrounding view was for miles and distances a bit deceptive, but the different colors of the sand were just so entrancing. Every time part of me wondered if I should turn back now, I would spot another landmark in the distance and say I’ll walk to there and then turn around. Eventually I did decide to turn around after a nice stop at some natural pools and resting a bit to drink in the view and some water to gird me for the long, slow walk back to the trailhead. I eventually did make it back to the trailhead and Mom and I marveled one last time at the amazing view before us before deciding to head back down. On the way down, we stopped at some different pullouts and viewpoints just to get a different vantage. One particularly worthwhile stop was at Kalahaku Overlook. This stop is only possible when you are DESCENDING the road, since there is no turnoff when you are ascending the road. This spot is located a bit after mile marker 19 and provides more great mountain views after a short walk. 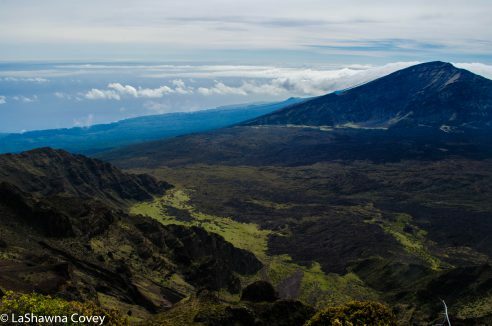 It provided a very different, but extremely beautiful view of the crater and is well worth your time. 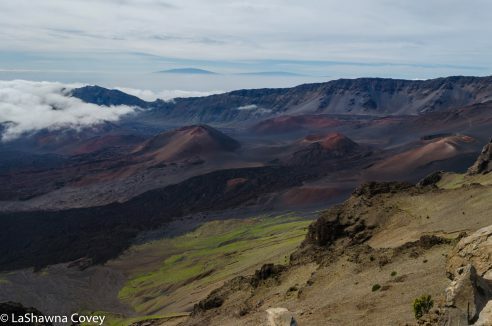 We stopped at another viewpoint, the Leleiwi Lookout, which is located just after mile marker 17, and it had a short hike (about 1/2 mile round trip) out to a completely different view which was of western Maui, and you could see all the way to the ocean miles away. You can see a good chunk of the island and it puts it all into perspective. 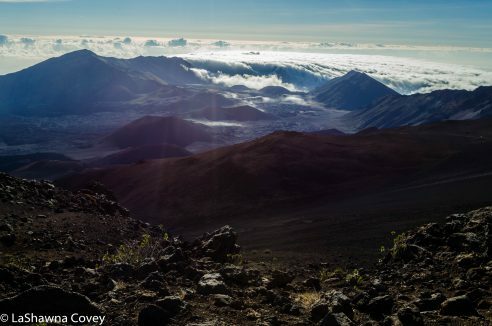 If you are visiting Maui, I HIGHLY recommend this as a day trip. I can personally attest to how nice the sunrises can be (though they obviously won’t be on rainy days), and I have heard the sunsets are really nice as well. I can only imagine how spectacular the stargazing is up there on clear nights. We had planned on going back up for stargazing, but the clouds started rolling in, and we didn’t want to take the chance of driving up all that way for nothing, and elected not to go. 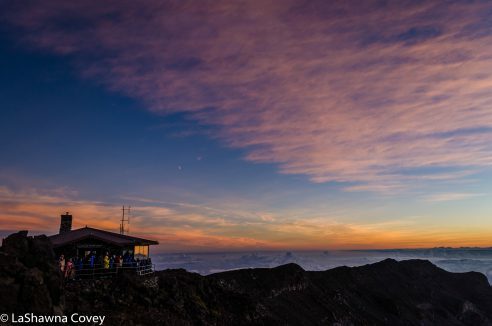 But stargazing from a Hawaiian mountaintop is very much on my list of remaining must-do activities at some point in my life. With that being said, there are a couple things to keep in mind. One of the big things is the drive time. If you are coming from upcountry, you need to budget AT LEAST 60 minutes to get to the top. Even more so if you are staying anywhere else. So that means if you want to see a sunrise, you will need to get up VERY early. Also keep in mind that this is a hugely popular activity, even in a supposed off season, so don’t expect you will be alone. Again, another reason you need to leave early. One to get there and two to get a parking spot and three is to get a clear viewing spot. The parking attendants at the upper visitor’s center were adept at dealing with the throng of traffic and managed to squeeze everybody into bus lanes. However, keep in mind that unless you are on the end, you are liable to blocked in for a period of time. 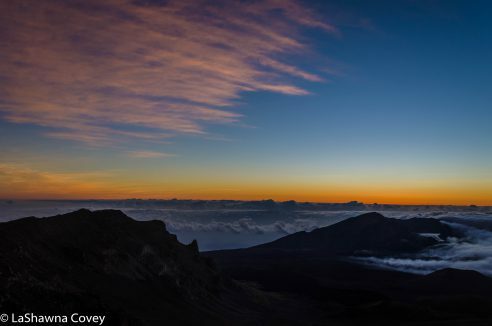 The good news is that most of the people visiting for sunrise are there just for the sunrise, so they are likely to leave within 30 minutes of the sun rising. Since we planned on spending a couple more hours up top, we just had to wait for our car to be unblocked and then re-parked in a now available car parking spot. Also keep in mind that it is cold up there. I brought my fleece jacket, warm hat and gloves solely for this trip and they were definitely needed until the sun warmed me up. 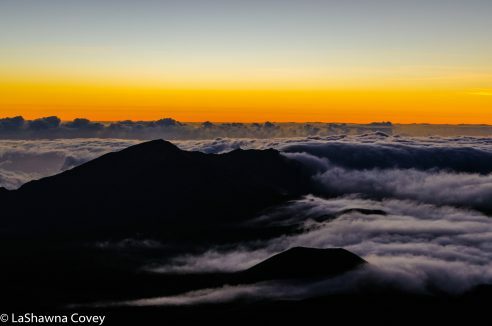 If you love sunrises and you love beautiful mountains, a trip to Haleakala National Park summit is not to be missed. 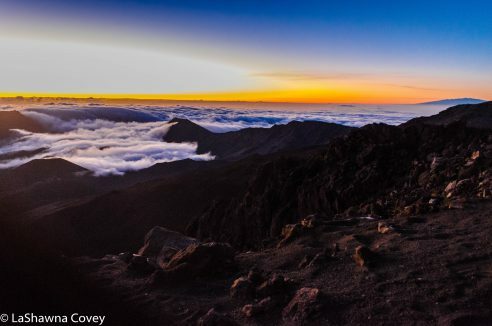 This entry was posted in Photography, Travel and tagged Haleakala Crater, Haleakala National Park, Haleakala National Park hiking, Haleakala summit, Hawaii, Hawaii sunrise, Maui, Maui hiking, Maui sunrise, Sliding Sands Trail, summit hiking.